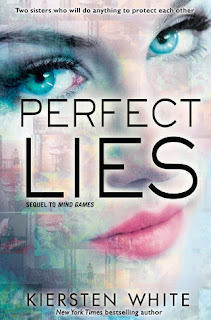 WOW: Perfect Lies by Kiersten White ~ Love.Life.Read. Hosted by Jill at Breaking the Spine, join us as we highlight titles we are looking forward reading. I thoroughly enjoyed Mind Games and since I read it, I have been looking forward to the second installment to see how Annie and Fia continue to reclaim their lives as well as to see if James is legit. Something tells me all will not be as it seems. What books are you looking forward to being published soon? I saw Mind Games on another blog this appears to be the sequel? I like stuff like this, mind powers. Thanks for sharing! This is the second book--Mind Games I really liked it so be sure to get to it when you get a chance. Definitely try if psychological thrillers interest you. I still haven't read the first book in this series! I definitely need to get to that soon. Great pick! Oh it's a sequel :) I guess you really enjoyed Mind Games to look forward to this one. I will check the first book out and see how it goes. Thanks for sharing this title. It is a sequel to Mind Games, which if you like psychological thrillers, you might like to check it out. I know I have Mind Games in my TBR somewhere. I'll have to dig it out so I'm ready in time for this one. :) It is a good if you like those type of books. I never did get around to reading the first book. :( I hope yuo get to read this sequel soon!